Did you know that the lesson author, Dr. Keith A. Burton, publishes a lesson commentary video every week on Vimeo and Youtube? It's only 15 min long, and he shares his views on the subject of the lesson, including some things that didn't make it into the published lesson. We point you to his video and the Hope SS lesson video every week on the Sabbath School Net Home Pages. Read for This Week's Study: Matt. 19:16-22; John 13:34-35; Gal. 6:1-5; Acts 17:31; John 5:30. Memory Text: If you keep My commandments, you will abide in My love, just as I have kept My Father's commandments and abide in His love (John 15:10, NKJV). In most nations a hierarchy of laws exists. At the top are laws that come from the national government and that bind all who reside in the country. Then there are laws on the provincial level that pertain to the inhabitants of certain territories. Finally, local laws govern the smallest districts. Although each division within a country is permitted to make laws that are relevant to its constituents, none can make a law that contradicts the law of the nation. And though circumstances may dictate that a certain law be applied in different ways, the application cannot deviate from the spirit of the law. As the Supreme Head of the universe, the Creator God has established laws for all of His creatures. When Jesus Christ voluntarily transformed Himself into human flesh, He gave Himself to a life of obedience to His Father (Phil. 2:5-11) and to His Commandments. Thus, everything that Jesus taught, the perspective that He put on the law, even the new commandment that He gave, was always in full harmony with the law of God. *Study this week's lesson to prepare for Sabbath, May 24. Some believe that the Ten Commandments, delivered through Moses at Sinai, were relevant only to the Israelites before the Cross and are not binding in the New Covenant era of grace. Others teach that Christians are free from the old law, but only those of Jewish heritage, and not Christians, are still expected to adhere to it. As we have seen, though the Bible does teach that the works of the law can save no one, no passage gives a person license to violate God's law. If any did, it would be a license to sin, and the Bible would blatantly contradict itself on a crucial topic. In this context we remember that God revealed the terms of His covenant to Israel on tablets of stone that contained the law. However, the Bible contains many other commandments that cover details not found in the Decalogue. In seeking a comprehensive understanding of God's will, the rabbis counted 613 scriptural laws, which they anchored in the Ten Commandments. Jesus appears to go beyond the rabbis when He announces that He has not come to abolish the law or the prophets (Matt. 5:17, NRSV; emphasis supplied). While summarized in the Ten Commandments, the law of God contains every divine command spoken directly to or through His prophets. Compare Matthew 19:16-22 and 22:34-40. What do these verses tell us about Jesus and the Ten Commandments? Although there are hundreds of commandments that God has revealed in His Word, the Ten Commandments provide solid principles that can be applied to all other laws. Hence, Jesus mentioned five of the Ten Commandments when speaking to the rich young ruler. There is an even more potent summary of God's law in the commandments found in Deuteronomy 6:5 and Leviticus 19:18, which is to love God and to love one's neighbor. Jesus declares, On these two commandments hang all the Law and the Prophets (Matt. 22:40, NKJV). Ultimately, Jesus and His Father are united in purpose as they urge the people of God's creation to love as they have been loved, and obedience to the law is foundational to how that love is to be expressed. What in your life shows your love for God and for your neighbor? Scripture provides a number of examples of Jesus' fidelity to the law of God. For instance, although His words in Luke 2:49 imply that at a young age He understood His identity, when His earthly mother expressed the hurt she felt that resulted from His straying from the family, He humbly accompanied His parents home and was obedient to them (Luke 2:51, NIV). On another occasion, Jesus refused to bow to Satan when tempted in the wilderness because worship was reserved for God alone (Luke 4:8). And there are several illustrations of His Sabbath keeping (for example, Luke 4:16). Paul wrote that Jesus' entire life was based on obedience to God's will (Phil. 2:5-11), and Hebrews says that, although tempted, He never sinned (Heb. 4:15). Thus, He could say as He approached His final hours, I have kept My Father's commandments and abide in His love (John 15:10, NKJV). Read John 13:34-35. What did Jesus mean by saying that this was a new commandment? Jesus understood that there is a relationship between commandment keeping and love. Though we're not used to talking about rules of love, one could say that, in a real sense, the Ten Commandments are those rules. They show us how God wants us to express our love for Him and others. God is love (1 John 4:16), and so in presenting His commandment to His disciples (John 13:34-35), Jesus is simply amplifying the law of love that originated in His Father (John 3:16). Now, though, more than just loving each other as ourselves, we are to love as Jesus loved us. At the time when these words were spoken, the disciples could not understand them; but after they had witnessed the sufferings of Christ, after His crucifixion and resurrection, and ascension to heaven, and after the Holy Spirit had rested on them at Pentecost, they had a clearer conception of the love of God and of the nature of that love which they must have for one another. -Ellen G. White, The Acts of the Apostles, p. 547. With today's lesson in mind, read 1 John 3:16. How can we have this kind of love in our own lives? How can we die the kind of death to self that is needed in order for us to express such love? Take a close look at the references to law in 1 Corinthians 9:19-23. What is Paul saying here? Why such a strong emphasis on law? God's desire is that all people accept His gift of eternal life and become citizens of His everlasting kingdom. In 1 Corinthians 9, Paul reveals his method of attracting people to God's kingdom. He understands that there are cultural barriers that hinder people from making a decision for the gospel. Paul is willing to adapt to the culture of the group to whom he was witnessing for the sole purpose of seeing them saved. Ultimately, all who become a part of God's kingdom will be subject to His law. Consequently, those who minister for God must also be in line with God's will. Paul is quick to state that although he uses innovative methods to reach people, he is always careful to remain under the dictates of God's law. His desire to see people saved will not allow him to compromise the laws of the God he is asking them to serve. He may adapt to cultural laws but only if there is no conflict with the ultimate law. The principle that governs his method is the law of Christ (1 Cor. 9:21, NASB). We can also understand Paul's reference to the law of Christ as the method that Christ used. It was a method based on love for all people and not for just a select few. Paul does not intend for the law of Christ to be seen as an alternative to the law of God. The two work harmoniously together as the loving law of Christ is used to introduce those saved by grace to the law of a loving God. In fact, the entire section, in which Paul so openly explains all that He is willing to do in order to reach the lost, is a perfect example of the kind of self-sacrificing love that is revealed in the law of Christ. How much self are you willing to deny in order to reach others for Christ? How much self have you already denied in reaching out to others? How much of the law of Christ do you follow? Whether revealed in written documents or in nature, the law of God discloses His will to every person capable of understanding (Rom. 1:20, 2:12-16). Consequently, no one can claim to be ignorant of the basic requirements of God. All have sinned and fall short of the glory of God (Rom. 3:23, NKJV) and thus are destined for destruction (Rom. 6:23, Ezek. 18:4). However, all is not lost: the curse has been reversed by the gift of eternal life, which has been made available through the life, death, and resurrection of Jesus Christ (Eph. 2:8). According to Paul, grace should empower the believer to live an obedient life (Rom. 6:15, Eph. 2:10, Titus 2:11-14), though, as we all know too well, we don't always live as obediently and faithfully as we should. According to Galatians 6:1-5, what is one way to manifest the law of Christ ? It is important to remember that everyone is subject to temptation and can submit to sin in moments of weakness. With this recognition, it is insensitive for a person to immediately condemn a fellow Christian who has fallen. Even Jesus, who had never sinned, was willing to assist those who have been overcome by sin. As Ellen G. White wrote of Jesus, He did not censure human weakness. -The Desire of Ages, p. 353. Paul admonished Christians to provide assistance for the purpose of restoration (Gal. 6:1). In other words, the person who has sinned should be encouraged to abide once again by the precepts of God's law. The law of Christ is driven by mercy. Had it not been for His sacrificial death, there would be no reason to keep the law of God. However, because Christ has made eternal life possible, there is an incentive for the faithful to resume keeping God's law after moments of weakness. Fellow believers should use the law of Christ as a vehicle to transport the repentant sinner back to the arena of God's law of love. Think about a time when you messed up and were shown grace, though you didn't deserve it (after all, if you did deserve it, it wouldn't be grace). How can you make sure that you remember the grace that you have received the next time that someone needs to beg some grace from you? Although God's law is a law of mercy, God will eventually use it as the standard of judgment. God has continued to provide opportunities for sinners to repent and pledge loyalty to Him, but the hour is coming when the cry will go out, Let the evildoer still do evil, and the filthy still be filthy, and the righteous still do right, and the holy still be holy (Rev. 22:11, NRSV). This announcement serves as a prelude to the final judgment. In Revelation 14:7 the first angel proclaims God's judgment, though a number of other texts speak of Christ's judgment (for example, Acts 17:31, 2 Tim. 4:1, 2 Cor. 5:10). How does John 5:30 help us understand the role of Jesus in judgment? Although Christ had laid aside His Divine nature when He became human (Phil. 2:5-11), He still had a special relationship with the Father. When the religious leaders accused Him of blasphemy, He informed His accusers that God had given Him authority to fulfill specific divine tasks (John 5:19-30), one of which was judgment. The fact that Christ has been assigned the responsibility of judgment demonstrates the mercy of God. Because Christ has become one with the human race, He is in a position to judge impartially. Given His familiarity with the human experience, Christ would not condemn a person unjustly. In fact, Christ suggests that condemnation does not come from Him, but that the unrepentant sinner condemns himself when he refuses to heed the command of God (John 12:48). Many are familiar with the content of God's law but don't know how to keep it. The law is not a check-list we use to see how close we are to the kingdom; instead, it is an instrument that expresses various principles of love. Fulfilling the law does not mean we obey it to gain personal favor with God, but it beckons each Christian to share the love of God with those who need it. As the standard of judgment, the law serves to measure the level of love that the individual has shared with God and humanity. When Christ presides over the final judgment, He will use God's unchanging law of love as the standard by which to judge (James 2:12). Further Study: Read Ellen G. White, Church Discipline p. 260-264; Consider One Another, pp. 260-266, in Testimonies for the Church, vol. 7. Bear ye one another's burdens, and so fulfill the law of Christ. Here, again, our duty is plainly set before us. How can the professed followers of Christ so lightly regard these inspired injunctions? . . .
We know but little of our own hearts, and have but little sense of our own need of the mercy of God. This is why we cherish so little of that sweet compassion which Jesus manifests toward us, and which we should manifest toward one another. We should remember that our brethren are weak, erring mortals, like ourselves. Suppose that a brother has through unwatchfulness been over-borne by temptation, and contrary to his general conduct has committed some error; what course shall be pursued toward him? We learn from Bible history that men whom God had used to do a great and good work committed grave sins. The Lord did not pass these by unrebuked, neither did he cast off his servants. When they repented, he graciously forgave them, and revealed to them his presence, and wrought through them. Let poor, weak mortals consider how great is their own need of pity and forbearance from God and from their brethren. Let them beware how they judge and condemn others. -Ellen G. White, The Signs of the Times, January 25, 1883. Reflect on the above paragraph from Signs of the Times. Why is it so important that we bestow grace on those who fall into sin? Think about some well-known Bible characters who fell into sin, whom God was yet able to forgive and continue to use. What important lesson is there for us in these examples? In what ways can we enforce church discipline while at the same time showing grace and mercy toward those among us who fall into sin? Why should we see the two concepts, discipline and grace, as not being in contradiction with each other? Rober [roh-BEHR] and his family live in a small town in eastern Peru. His wife, Roxana, began attending the Adventist church and took the couple's children with her. She often invited, Rober, but he wasn't interested in religion. However, in his heart, Rober sensed that his life wasn't what it should be. He often drank, but later felt guilty that his bad habits weren't a good example for his children. He wanted to be a better husband and father, but he didn't know how. Then an accident turned his life around. "I was drunk when I lost control of my motorcycle," he says. "I landed hard on the street, fracturing my skull and breaking other bones. I was taken to the hospital, unconscious. When I finally recovered enough to return home, Roxana spent hours reading the Bible to me and talking about what Jesus means to her. I had a lot of time to think about my life and God. One day I told Roxana that I wanted to make my life right with God. I wanted to marry her legally and be baptized. The pastor and a lay member came to study the Bible with us, and when we were ready, we were baptized together." "Before we were united in Christ, our lives were sad," Roxana says. "But now we sing and pray and read the Bible together as a family. We're so happy." Rober has returned to work, where he shares his new faith with his fellow workers. "Whenever I have a chance I tell them what I'm learning about Christ," he says. "I have a small computer and use it to show my fellow workers videos about the Bible and God." Rober shares his faith with his extended family. Although they aren't Adventists, they listen, for they've seen changes in his life. Seeing the difference Jesus has made in Rober's life makes them want to make changes in their lives as well. Rober has gone from wishing he could be more actively involved with his family to being a model of faith for his family. "We need fathers who will teach their children about Jesus and all He stands for," Rober says. "It's the most important thing we as parents can do." With Roxana's support, Rober hopes to return to school and study public health so he can help people live a more healthful life. It's one way he can be an example of faith to those around him. Our mission offerings help build churches in poor regions of Peru and throughout South America. Thank you for supporting mission with your gifts to God. 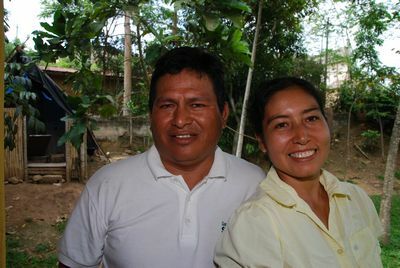 Rober Aquino and his family share their faith in central Peru.